The trend has caught on around the world, with Copenhagen's Noma and New York's Momofuku among those offering customers a wide variety of so-called speciality teas. They join British stalwarts, from the Fat Duck and Hix to Hibiscus and Gauthier Soho, which are all giving tea a starring role on their menus. "Coffee chains are realising that to grow their business they need a good tea offering. They had problems in the past because using water from a coffee machine does not produce good tea, but that is changing," Mr Gorman chairman of the UK Tea Council said. Health fears are also boosting tea sales, with green and white teas favoured for their antioxidants. Richard Vines, who chairs the World's 50 Best Restaurants awards, said: "People are drinking tea instead of alcohol at the end of a meal, so they are demanding a choice from restaurateurs." He predicted "tea-pairing" – matching different teas to certain foods – "would become a bit of a fashion", adding: "And why not? Tea has such distinctive flavours." 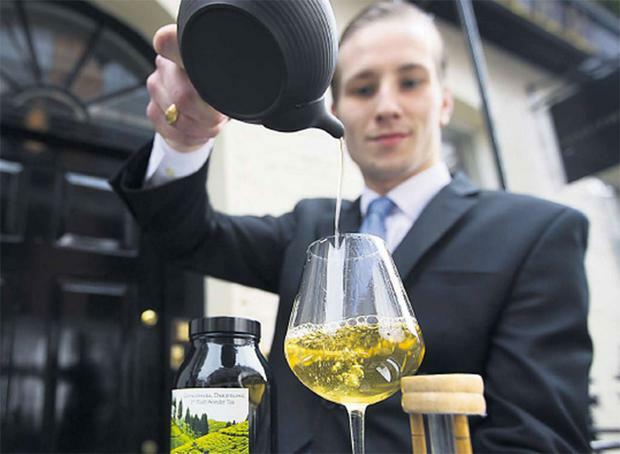 Alexis Gauthier, a Michelin-starred chef, said tea "enhanced the umami flavour" in many of his creations. He pairs a green tea with a spring starter of asparagus, broad beans and wild mushrooms. "In the past we'd have looked for a sauvignon blanc. But it's difficult to find something that doesn't kill [the flavours]. Tea is more subtle than wine." He matches each new menu with a different tea and says tea sales now comprise 30 per cent of drink revenues during lunch at Gauthier Soho. Lalani, a tea importer, recently launched a course to train tea sommeliers. "The tea renaissance looks at seasonality and provenance. You can focus in on particular gardens, producers, the day tea is picked, and how the terroir [a word usually associated with wine] makes a difference to flavour, structure, and quality," Nadeem Lalani said. "You enjoy tea just like a fine wine or a whisky." John Kennedy, who owns the café TeaSmith, recommends choosing tea for the effect it will have. "For a mid-afternoon slump, there is green tea; to go with lunch we suggest a digestive tea." He compared industrially produced teas, such as PG Tips, to instant coffee, adding: "We're a nation of tea drinkers but we drink such a narrow spectrum." Oddly, given its history, the US is helping to drive the tea revival. Wholesale tea sales have grown from $1.84bn (£1.21bn) in 1990 to $8.2bn in 2011, and the retail industry is worth $27bn, according to the Tea Association of the USA. That accounts for more than half of tea's global $50bn market. "There's more innovation in the States in tea houses because they don't have a heritage in tea like us," Teapod's owner, Huw Marks, said. He said the market in the UK had been "under-served because tea is very personal", adding: "We grow up with our own version of tea and how we like it." Despite being keen to expand, he said the future did not lie in separate tea and coffee chains. "I don't think it's tea or coffee. Most people drink both.